Email Success Starts with Data! Data is not just a buzzword; it’s the secret sauce to a successful email marketing strategy. 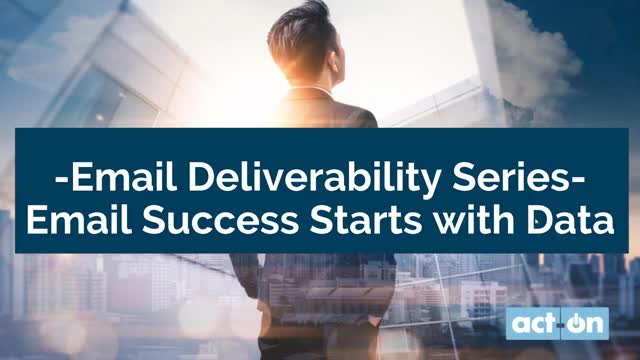 Join us for the next webinar in our Act-On Deliverability Webinar Series with resident expert, Andrew Kugler. He will discuss the topic of data focusing primarily on emails. There’s no need to panic! Yes, the GDPR is fast approaching, taking effect May 2018, and it’ll definitely affect how marketers email prospects and customers in Europe, but while there’s no reason to panic, you’ll definitely want to prepare. That’s why we’re here! We want to help you make the transition easier by equipping you with the information and guidance you need to successfully move forward with your awesome marketing efforts to the EU. Four out of five B2B buyers start their journey with a web search. Nearly three-quarters of the buying process is complete by the time a prospect is ready to engage with your sales team. With customers now in control, how do you create an effective marketing plan that resonates with target audiences? Compelling content, martech solutions that support your strategies, reporting plans that establish and track funnel metrics and KPIs – are all critical to marketing success. But it’s more important than ever to understand how customers make purchase decisions before you can put the right plan in action. Hear from Act-On’s B2B marketing experts as they explain how you can develop a great marketing plan that builds your brand, drives demand, and improves the customer experience. * Map your goals to customer lifecycle stages. * Innovate through new channels, tactics, and content. * Identify the technical systems needed to support your activities. * Develop KPIs and reports that prove value to the C-suite. It’s coming, are you ready? The busiest email sending season will be here before you know it. It’s never too early to start planning, preparing, and developing your email marketing strategy for the holiday season. In fact, it’s better to plan ahead – especially if you want to land in the inbox! The holidays are a time when inboxes fill up quickly with the latest promotions, discounts and time sensitive offers. Businesses just like yours are trying a variety of tactics to get their message opened, and even better, clicked on. The research shows it and the industry experts agree: A well thought out email marketing campaign can make or break your chance to get in front of a prospect. However, it’s not as easy as it may seem. Competing for attention in a prospect’s inbox, whether it be two seconds or two minutes, is no walk in the park. Act-On Software is the leader in Adaptive Marketing solutions that empower marketers to achieve the purposeful and personalized engagement that their business needs to thrive. Act-On makes customer data actionable, enabling marketers to strategize better business outcomes, drive more relevant multi-channel marketing, and generate higher customer lifetime value--all with the fastest time-to-value.